I had been told Beartooth Pass was a beautiful scenic drive. Although it was still a ways from where I was staying, I knew I would get no closer this year. It was an all day event and I drove over 200 miles, but it was very scenic. I'm glad I did it. The Beartooth Highway runs through Gallatin National Forest. Because of the time of year, most of the National Forest Campgrounds and Picnic areas were already closed for the season. We did stop at one picnic area and wandered down to the ruins of the old flume and power station. The flume and power plant were built in 1916 on the Clark's Fork of the Yellowstone River, but all that remains today are some piers of the flume and some concrete pillars from the power house. Built by the Western Smelter and Power Company, it provided 250 KW of electricity to the nearby mines. The power station only operated until 1925. The only business on the route was this Top of the World Store. They had water, drinks, snacks and gift items. I found some socks to purchase. Interestingly, they had no trash facilities. It was pack it out yourself. And their bathrooms were porta-potties. I guess the garbage man doesn't run up here. It was beautiful scenery. Lots of high mountain lakes. Never did figure out what this for. Almost looks like a ski lift of some type, but this was not a ski area. It just went down to the valley, with no indication there was any purpose at the bottom. I think there is a valid reason they do not recommend taking RVs on this road. Outside Red Lodge, MT, was the remains of the Smith Mine, part of the Bear Creek Coal Fields. In 1947 an explosion in the Smith Mines killed 74 people and was Montana's worst mine disaster. Because of this explosion many changes were made in the mining industry to make it safer. This mine operated from around 1910 to 1953. I made a large loop, going up the Beartooth Highway and returning to Yellowstone via the St. Joseph Scenic Byway. A leisurely excursion, it took 12 hours to travel the 200 miles. Lots of stops and of course lunch in Red Lodge. Found a spot in Mammoth Hot Springs Campground in Yellowstone National Park. 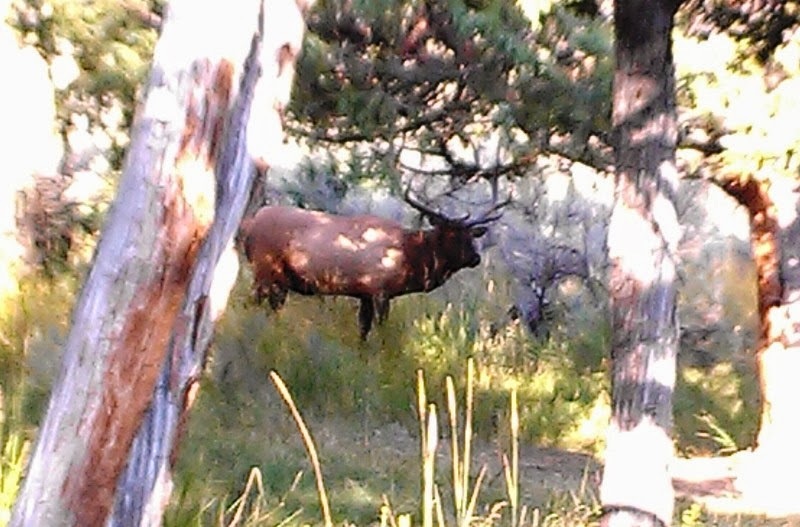 I don't think there was a day went by I didn't see Elk wandering through the campground. One day about a dozen females and their young decided to bed down in the field inside the campground. Met these wonderful people from Lousiana. Hi Don and Betty, see you in February. The old headquarters building for Fort Yellowstone is now the visitor center. A large cone which once spouted a geyser, or at least some visible activity. Although it looks totally dormant, the ranger says there is still hot water which rises up to 15 feet inside the cone. Palette Springs. They say the hot spring activity changes all the time, so if you come back several years later, it just might look totally different. The white is fairly recent lime deposits from the hot springs, while the yellow area shows current activity (the yellow is the deposit of microscopic life forms). The grey is the front is older, past activity, the grey being dirt and such which has taken up residence on the lime deposits. This butterfly decided to hitch a ride. Some areas hadn't seen hot spring activity is some time. The ranger said this area was very active last year. An indication of how the area changes. They had to block this trail only this spring. Opal Springs. This area is next to some of the ranger housing, and some years ago was a tennis court, before the hot springs became active in this area. Although you don't see a lot of water, you can see some steam rising above the cliffs, so there really is hot spring activity in the area. Now I'm on top of those cliffs and you can see the activity much better. Overlooking old Fort Yellowstone and Mammoth Hot Springs Lodge. You can always tell when a European has imported their RV. I don't think anyone in the US makes them like this. After some rain showers there were these wonderful double rainbows. I could actually see the entire rainbow, but couldn't get pictures of the entire thing. You can see the mine shaft headframes in the midst of downtown Butte. Starting in the late 1800s with gold and silver mining, it evolved into one of the richest copper districts, hence the nickname above. By the 1920s the population was 60,000, but by 1990 it had declined to 34,000, where it has stabilized. This is memorial to auditor, a pup which was abandoned in the mining area and lived for 17 years. No one could catch the dog, but the miners put out clean water and food. It survived in the toxic mines, no one knows how, and would disappear for days or weeks, then show up unexpectly again. He became the mascot of Butte, representing the spirit and toughness of the city. These swings are one of kind and are over 100 years old. My guide on the tour bus remembers these from his childhood. Although most of the underground mines closed in the 1950s, above ground mining continued until 1983. Most of what you see continuing today is clean up of the toxic waste sites. More mine shaft headframes found in town. The Berkeley Pit opened in the 1950s and was mined until the 1980s. When the underground mines closed, much of the toxic wastewater flowed into the pit. It was designated as a Superfund clean up site in the late 1980s, but it was not until the 1990s that serious clean up work started. The water is so toxic that any birds which land and stay longer than six hours, will die. They now have horns which sound anytime birds land on the toxic water. Part of the clean up effort involves taking the toxic water and processing it with recycled tin cans, whereby the result is the removal of high levels of copper. So if you wonder where all the recycled tin cans are taken, you will find they are sent to Butte. The Dumas Hotel/Brothel. Opened in the late 1800s and operated until 1982. The Mai Wah Museum shows the history of the Chinese immigrants to the area. The Mother Lode Theater. Originally built in 1923 as a Masonic Temple Theater, during the depression it was leased out as a movie theater. Eventually it fell to ruins for lack of funds, but in 1980 was restored and remodeled and reopened under the name of Mother Lode Theater, reflecting the history of the town. Many of the homes reflect the money that once existed in this town, even though the homes have fallen into ruin. Some of the homes are being restored. Because of the many immigrants brought to Butte to mine, you find many styles of homes and architecture. Built in 1906, this home mirrored wealth and power. You can definitely tell the difference between the mine owners homes and the lowly miners. But even miners made good money. Our tour guide said he could make $200 a day in the deep mines, versus $20 a day for laborers above ground. The issue was your chance of living to retire was very low if you worked in the deep mines, some as deep as 4,000 feet. A local mining museum has many pieces of equipment from the local mines. This home was built by William Andrews Clark, one of the Copper Kings, for his son Charles. It was built based on Charles' description of a French Chateau that Charles had visited while in France. The home has 26 rooms, including a ballroom on the 4th floor. Headframe of the original Butte mine, operating from 1878-1976. It was 3,569 feet deep. I wish I had had more time to explore this interesting city. Just one more place to return to.